Bodegas Martinez Laorden Lanzado Joven Rioja - A modern and appealing fruit driven young Rioja, full of aromas of red fruits and cherries. Bodegas Navajas Rioja Crianza - Cherry red in colour with violet highlights. The aromas are lively and fruity, typical of the variety and are combined with good oak notes. It has a long, rounded and pleasant finish. Bodegas Navajas Rioja Reserva - The nose has lots of ripe black fruit aromas leading to bramble fruit and vanilla flavours with an enticing long rich velvety finish. Cantos de Valpiedra Rioja - A new "second wine" from the renowned Finca Valpiedra, Cantos offers an intense aroma combining berry fruit with a floral lift and tobacco/chocolate notes. Castillo Clavijo Rioja Crianza - Red cherry and spicy oak linger on the palate with a smooth finish. Castillo de Clavijo Gran Reserva - This Rioja perfectly balances tradition and innovation. Red berries, Mature dark fruit and a touch of spice leave a delicious lingering aftertaste. Castillo de Clavijo Rioja Reserva - This Rioja perfectly balances tradition and innovation. Red cherry. Mature dark fruit and vanilla leave a delicious lingering aftertaste. Castillo de Clavijo Rioja Tempranillo - A soft and juicy Rioja with red fruit flavours, black cherry and sweet vanilla. Castillo Viento Crianza - Juicy, easy going Rioja with a gently perfumed nose &amp. soft underbelly of raspberry, strawberry &amp. red cherry fruit flavours on the palate. 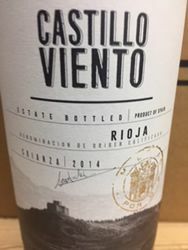 Castillo Viento Rioja Joven Tinto - Juicy, easy-going Rioja with a gently perfumed nose & soft underbelly of raspberry, strawberry & red cherry fruit flavours on the palate. Coleccion Vivanco 4 Varietales - This deep red wine has aromas and flavours of mature black and red fruit, as well as sweet creamy, balsamic and toffee notes. Conde de Valdemar Gran Reserva - Rioja On the nose, this Gran Reserva shows spicy aromas of black pepper and vanilla combined with ripe black fruit. Conde de Valdemar Rioja Crianza - This Rioja is classic in style with a well deserved reputation for quality. Intense aromas of ripe fruit well integrated with attractive spicy nuances from the oak. Conde de Valdemar Rioja Reserva Complex aromas with subtle spicy notes and ripe black fruit touches, leading to a generous, intense palate full of plums, raisins and chocolate. Conde de Valdemar Tempranillo - Lovely smooth young wine, with bright cranberry/cherry fruit and some creaminess on the finish. Dinastia Vivanco Rioja Crianza -A modern styled Rioja with the focus firmly on bright, juicy fruit flavours of cherry, violet and vanilla with a touch of spice.